It’s P-O-P-S-I-C-L-E time! Surprise your little loves with a summer frozen treat. When I am going for a visit to see my grandchildren, I love to bring them a surprise. I chose popsicle containers on this current visit. It took a little bit of waiting to create a recipe and freeze them, but they were definitely appreciated. My granddaughters got excited when I showed them what I brought. The toddler didn’t understand what the colorful container was. She thought it was a toy. But when she got to eat the yummy fruity treat, she was delighted! Nutritious treats can really be fun to make for children. When they see you munching on good snacks, they’ll want the same thing you try. If Mommy, Daddy, Grummy and Grumpy (that’s me and my hubby’s grand-names) not only feed our little tots healthy food but EAT them as well, that’s what they will want. Beware, though, when you splurge on the fatty, sugary, fried stuff. Kids LOVE junk food just as much as BIG kids. 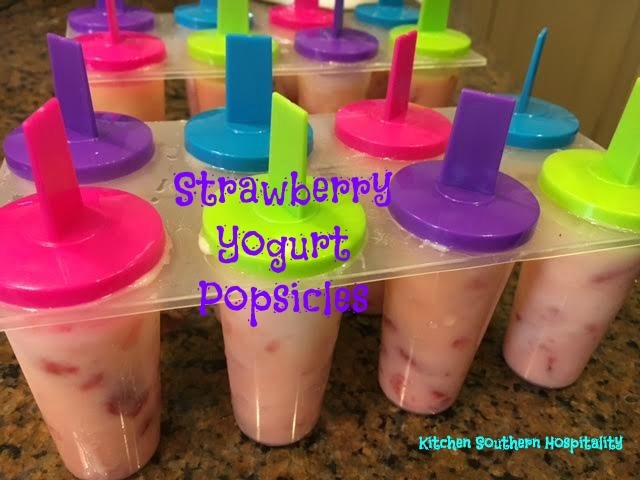 Strawberry Yogurt Popsicles is the recipe I’m sharing with you. Imagine how many possible recipes you can come up with by changing up the fruit and yogurt. How about these frozen fruit flavors? Orange cream – Blend oranges and yogurt or any other cream you’d like. Chocolate – Make a low sugar treat with sugar-free chocolate powder mixed with 2% milk and a little whipping cream. Add to or change up those ideas to make your own, and come back to tell me about your super summer frozen treat results. Wash strawberries, and slice them into very small, thin chunks. Mix strawberries with yogurt, buttermilk, and orange juice. Fill containers, insert sticks, and put in freezer. 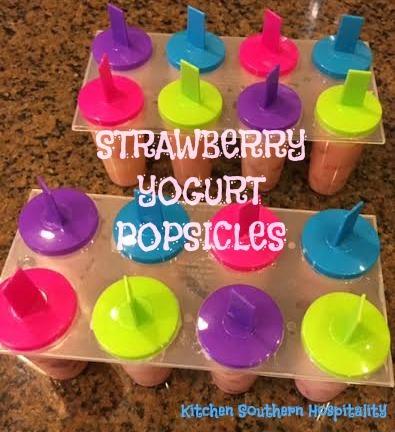 Optional: Mix yogurt, buttermilk, and orange juice and fill containers with layered yogurt mix and strawberry chunks, beginning and ending with the yogurt mix. Frozen popsicle snacks are the perfect treat for cooling off in the summer. Amaze your kiddos by creating fun fruity frozen desserts. Got a cool frozen popsicle recipe? Share with Kitchen Southern Hospitality! These look so good. I love making healthy treats for my family.